Naysayers have obviously never heard of them or tried their fried chicken. Which by the way, is very very yummy. Customers have been said to queue for at least an hour and a half till they lay their hands on the chicken. When I went on a quiet weekday afternoon at 4pm, I saw no crowd outside the 6th storey shop at Lucky Plaza and thought to myself, “Heng, the line is not too long.” Only to realize the vacant shop next door is used to contain the queue! 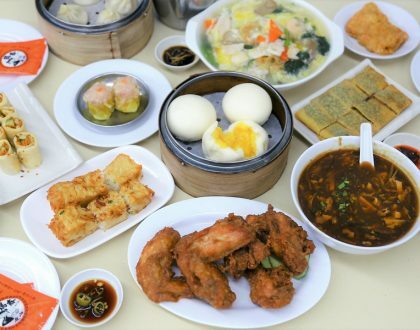 With a capacity of 300, finding a seat is not much of a problem as most customers ta-bao (takeaway) chicken by the buckets. The moment of truth. 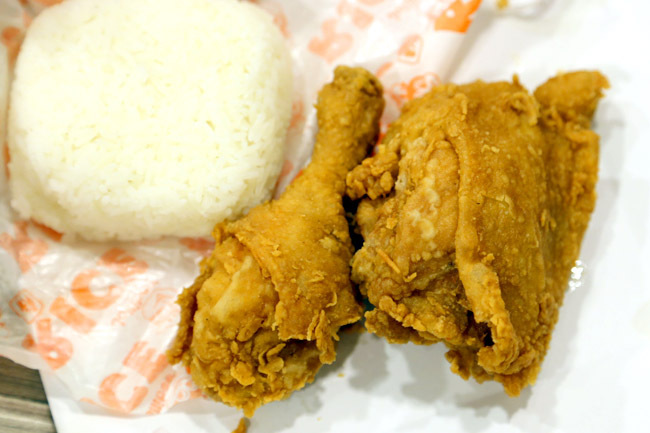 Jollibee’s 2-piece Chickenjoy value meal ($6.60, $16 for 6 piece bucket) comes served with rice and a drink (Pepsi, no Coke) and is indeed like what it claims to be – crispylicious and juicylicious. Its deep fried golden outer layer goes crisp-crunch, especially addictive when you dip it in a specially-made gravy and pop the entire thing in your mouth. (This gravy kind of reminds me of the mashed potato sauce of its competitor though.) 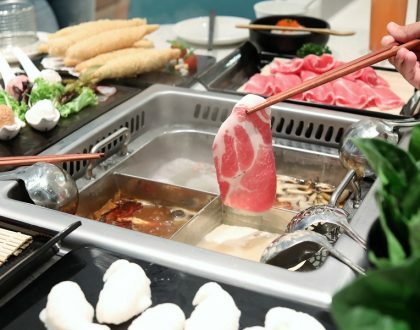 The inner meat remains very succulently juicy, yet not in an oily way. Their Double Yumburger with TLC value meal ($6.00), made with 100% pure beef patty and served with mayo and creamy cheese, is another front runner. 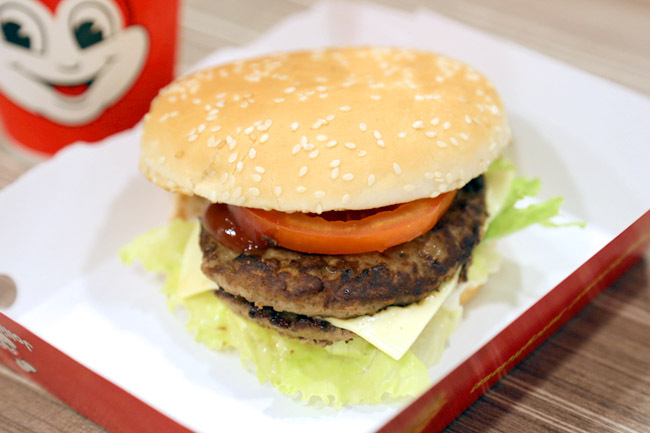 While I am not that huge a fan of its bun, the patty is not overly dry and has a slight meaty tenderness which I enjoy. 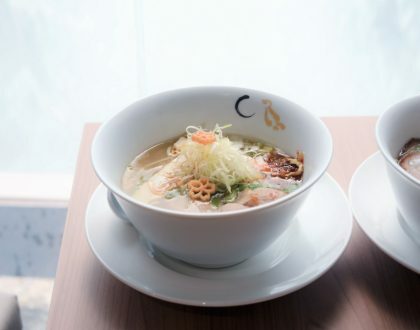 It is said that their sweet style spaghetti ($3.00) has changed its flavours to accustom to local palates. Taste-wise still feels too ‘kiddy’ for me. I would much prefer a more savoury touch, but it’s personal preference. Hopefully the queue will die down in a while though it doesn’t look like anytime soon. A second branch is already in the works. 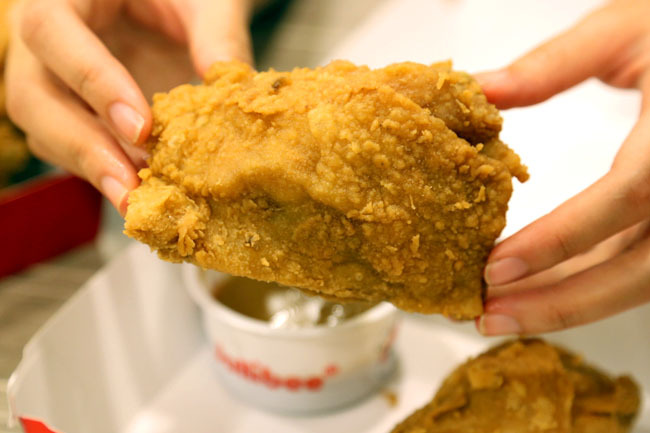 Jollibee’s Chickenjoy is highly satisfying, hands down one of the best fried chicken in Singapore. I am already salivating just thinking about it. Chew yew lee, what's wrong w u? Please focus on food and not such crazy comment and support their food means nothing. I'll like to ask if u eat sushi, Japanese food or watch jap av?? Their forefather took over Singapore n torture our pple, so is that traitor if u do? Anyway back to food before I perform oxymoron. I say Singapore's signature is do and me chicken! Haha. Too bad their food ain't exactly properly franchised or chained. No consistency. Please Singaporeans, stop boycotting our Filipino fast food chain for your accusations of "Filipino first" policy. Always open your history books that the great Lee Kuan Yew asked so many things about our President Marcos on how to develop your country. He willingly gave everything just to help Singapore in attaining what you are currently attaining. And now just because you are more powerful and wealthy than us, you can just boycott anything about us. Do not forget your history Singaporeans. No one can beat our chicken joy. This is too good to be true, try it! wahhh you went to queue? 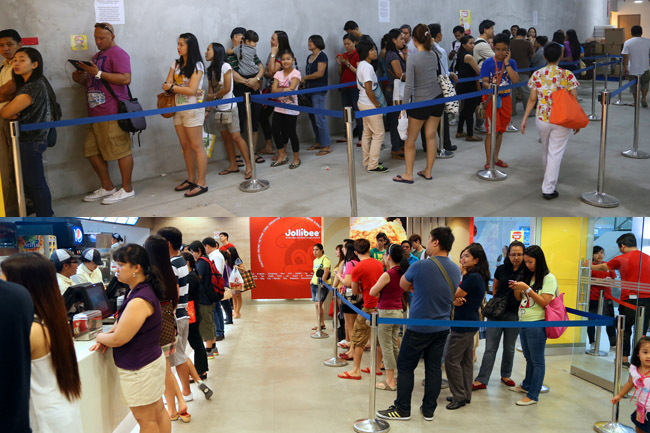 I was there and saw the long queue and I gave up to eat one of the Filipino food stalls, which was very good. I am a recent visitor to your Food Blog Daniel and really enjoyed the articles you have here. 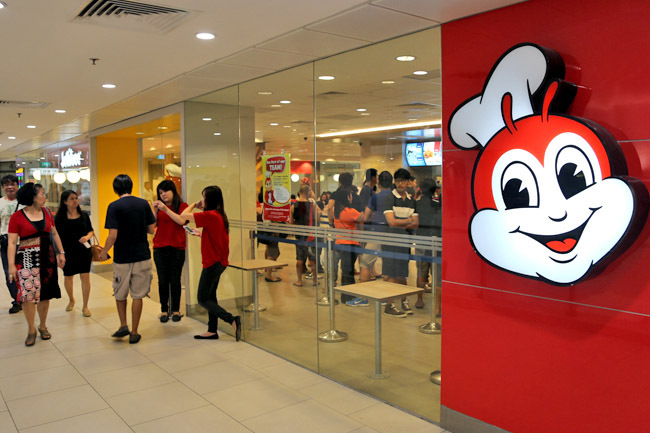 I would have thought most "locals" (Singaporeans) would really boycott Jollibee (more for political reasons not because of its food and service quality) but thanks for taking time out to check out the Filipino-branded store and writing an objective review. You guys are lucky! 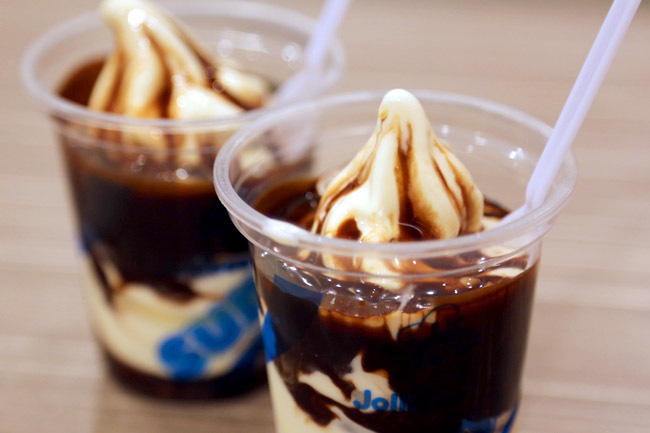 I wished there is a Jollibee store here in Melbourne! Thank you for the support! I hope to be back Melbourne really soon. I miss the food there too! You are a traitor to Singapore.. Daniel. Chew yew lee, what’s wrong w u? Please focus on food and not such crazy comment and support their food means nothing. I’ll like to ask if u eat sushi, Japanese food or watch jap av?? Their forefather took over Singapore n torture our pple, so is that traitor if u do? Anyway back to food before I perform oxymoron. I say Singapore’s signature is do and me chicken! Haha. Too bad their food ain’t exactly properly franchised or chained. No consistency. CHICKENJOY® is a registered trademark of Jollibee Foods Corporation in Singapore. Thank you for your support. 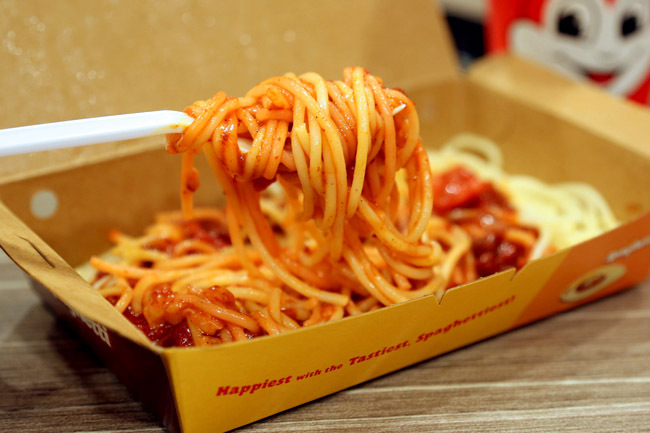 Yea, spaghetti is more for kiddies, that’s why it is popular back in town, household name for youngsters. I occasionally blog about food too. However, mine is more in my local country, Philippines. I read your posts about Jollibee. Thank you for your very objective opinions. I appreciate it in behalf of my fellowmen. I’m adding you up in my blog reads. I enjoy your blog. Howdy! I simply would like to give a huge thumbs up for the great info you’ve right here on this post. Try “Pinaupong Pusa” at “Sinampalukang Kalapati”. TWO THUMBS UP!